Three right knee sprains and one hyperextended right elbow are part of the laundry list of injuries left tackle Kolton Miller has suffered —and largely played through — this season. ALAMEDA, Calif. — It happened again Sunday to Kolton Miller. 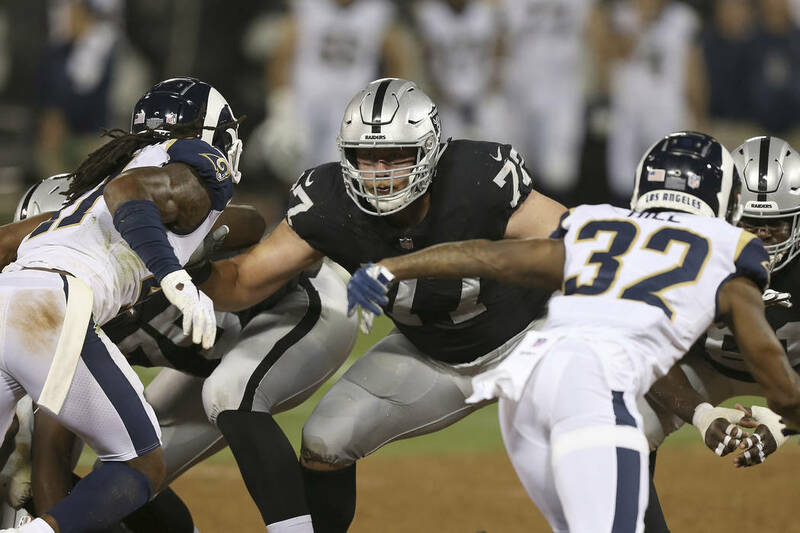 In the third quarter, the Raiders left tackle engaged an Arizona Cardinals defensive lineman on a DeAndre Washington carry near the goal line. Center Rodney Hudson fell to the ground, incidentally crashing into Miller’s right knee. The same knee Miller sprained during the second quarter in Week 4. The same knee Miller re-sprained during the first quarter in Week 9. Following a brief exit, he finished the 23-21 win. Miller is gaining experience with knee sprains and top NFL edge rushers. The rookie first-round pick dealt with both again Sunday versus Pro Bowl defensive end Chandler Jones. Coach Jon Gruden said that he’s impressed with the toughness the No. 15 overall pick has shown. Three right knee sprains and one hyperextended right elbow are part of the laundry list of injuries Miller has suffered —and largely played through — this season. He has started every game. His only significant chunk of missed time occurred in the second half of a Week 9 blowout loss to the San Francisco 49ers. Miller’s overall mental profile gives the Raiders confidence he can realize his potential in the coming years, as he continues to pack strength onto an athletic 6-foot-9 frame. — Running back Doug Martin missed the second half to a second-quarter ankle injury. “I think he’ll be OK,” Gruden said.